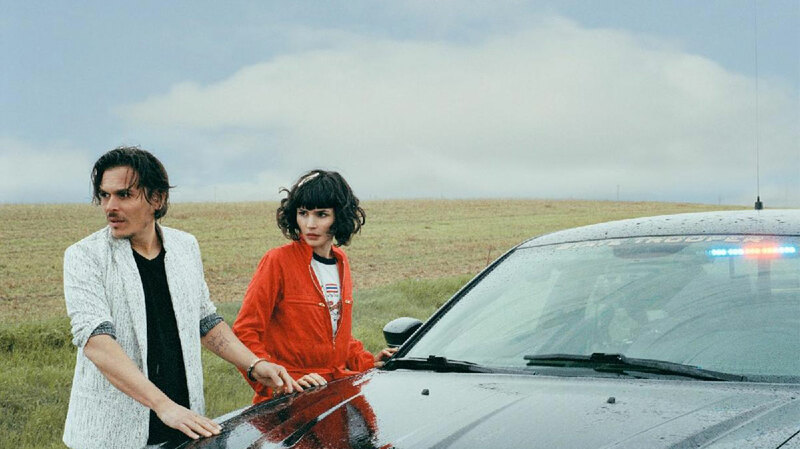 Four years on from Both Ways Open Jaws, The Dø are back and showcasing a new, synth-heavy aesthetic. Here, the Finnish-French duo explain the reasons behind their shift in sound, and lay bear the private turmoil that underpinned the creative process on their third LP, Shake Shook Shaken. There’s been a big shift in your sound since Both Ways Open Jaws, moving towards more laptop beats and synths. What inspired that change? Olivia Merilahti: [The change] is the result of a mix of different circumstances. We actually started the process with two tracks on the previous album, ‘Dust It Off’ and ‘Slippery Slope’. But on the previous tour we had to go to America without our drummer, so we had to start working with drum machines. Then we realised we could also use synths once in a while, and then it became a proper choice to try our music with new tools; tools from today and things that, usually, traditional musicians don’t really use. I feel like we have been in-between the traditional indie scene – that uses only “real” instruments – and the electronic scene. Is it also a consequence of your musical tastes evolving? Dan Levy: We are always looking for change; we can’t redo what we did before, and we want to have fun and to discover new sound. But yeah, maybe I was listening to more electronic music. I remember at one festival I saw a DJ set by Paul Kalkbrenner, and there was just this kick, and there were 30,000 people going crazy to the beat. And that was when I realised how amazing and powerful and magic this energy was. I feel the same with hip hop: the beat brings you somewhere, perhaps even more than a song. But if you can mix the both, that’s the best way to do it. OM: On our previous other albums, we listened to a lot of jazz, because we didn’t allow ourselves to listen to modern pop music because we were afraid to be too influenced by what we were listening to. So, it was ok to be influenced by jazz or something that was really remote from what we were doing. But this time was different. I’m a big hip hop fan, and I also love electronic music, and started discovering a lot of famous artists that I didn’t know about before, so suddenly we were on another musical obsession. So, of course, it changed our music in some way and you can tell. DL: But, you know, when Pink Floyd used synthesisers, and The Beatles used Mellotron, it was completely new during this period. And afterwards, all bands wanted to have the same sounds as those people. I think we wanted to use only free plug-ins with free synthesisers because we wanted to do an album from our time. Music was the only branch that we could hold onto. It was the only thing that kept us above the water. You left Paris to record the album in an 18th century water tower. How did you discover it? DL: Through a friend of ours. I was fed up with Paris, and I wanted to wake up in the morning and just be focused on the music. When you’re in a city – surrounded of your friends, constantly on your phone and the internet – you have so distractions. In the countryside, all I have is a studio. OM: I know what you mean but at that time I needed both. I lived in the centre of Paris and I needed this urban energy – this temptation, this hustle, this noise – and that nourished part of the album. And then I drove to the countryside and I was completely somewhere else. It was a bit schizophrenic, but I needed this discrepancy. It was a great way to test the songs too, because I would come back from the countryside with demos and I could feel if the music was better in a rural environment, or if they would also work in Paris. On ‘Trustful Hands’ you sing, “Chaos is my second name, I don't mind where I land,” and on ‘Despair, Hangover, Ecstasy’ there’s the line, “We're not so different from convicts on the run.” Are you literally discussing life on the road or is there more to it? OM: ‘Despair, Hangover, Ecstasy’ is definitely about artists on tour, or the life of a person travelling a lot and who is not anchored anywhere. ‘Trustful Hands’ is more of a sentimental song, I think. It’s about making sure there is always something happening emotionally. And also, as an artist, it’s important to feel comfortable in chaos because that’s where you get inspiration from. It’s a real, real challenge, but that’s part of the job. Did you notice certain themes evolving? And also, there’s maybe something heroic in the lyrics and music as well. I liked the idea of appearing like a – not necessarily a comic hero – but some kind of hero. We needed something triumphant. It’s about being weak and strong at the same time. And then that feeds into the album title, too, which is taken from a Finnish ancestral term? OM: Sisu? Yes, that’s the courage to keep going and never to feel sorry for yourself. We had been through difficult times individually, so recording the album required a lot of bravery somehow. I know it’s just music, but once in a while you wonder why you are doing this; just the two of us in the middle of nowhere. Why was the process of making this album so problematic? OM: ...It was a traumatic year. Music was the only branch that we could hold onto. It was the only thing that kept us above the water, and kept us healthy somehow. And I think I always feel very, very lucky and very grateful because music is our way to express and recycle all these bad things than can happen - we can transform these sad things into art. So that’s a very strong thing to realise; how far music can take you, and how much it can save you. In terms of the creative process on Shake Shook Shaken, what were the challenges? OM: We had never focused on that very digital side of music before, so that was a challenge, definitely. But it was a good challenge. We wanted [the songs to sound] warm and bouncy somehow, instead of very cold and flat. And we really wanted to focus on the song and what’s absolutely essential; to go straight to the point structurally, and to not get carried away with long intros and outros. DL: You know, people are listening to music everywhere – in the car in the house, doing something else – and because of that you don’t have the opportunity to listen to the small details. You want the intro, the verse, the chorus, the song. In other words, you wanted to be more direct, to reach more people? OM: I don’t know if we will reach more people, but we really needed that for ourselves. We were looking to get caught up in a certain energy too. It was not about being snobbish at all; it was like, “If we want to go there, we go there.” “Snobbish” might not be the exact word maybe.... We didn’t want to intellectualise too much, or be too brainy about the music. We really wanted it to be more physical. Is there anything you learned about yourselves as individuals, making this album? OM: I think we learned that we were stronger than we thought. And today, I feel that because we had that [difficult] time in our personal lives, I realised that music can be helpful, you know? I was listening to Al Green and old soul, with simple lyrics, and I was touched; it helped me. And I felt like I understood music for the first time in my life. So this is what I think we did on this record. I don’t know how we did it because it was really hard for us, but we did, and I’m so proud and so happy to be here, doing concerts. Well, you recently won ‘Best Rock Album’ at Les Victoires de la Musique, so the reactions have been really positive. DL: Yeah, it was really great. It was like, so you can do an album with both of us, and be in difficulties in our life, and have success afterwards. It’s really, really positive. You’ve been working together for 10 years, now right? OM: Yes, we met 10 years ago, but The Dø has been around for less time than that. How have your motivations for making music changed in that time? OM: I think the only goal in the beginning was to try as many genres as we could. We were starving for different musical experiences. And that’s still the case, so that’s a good sign. When we start the creative process, there’s always this desire to surprise each other, so that’s always why we go beyond and try something new. One thing we’d like to do is to have this album played by and Orchestra. In France there’s this big new Philharmonic venue, and it’s an amazing place acoustically. I think it would make a lot of sense to have this very synthetic, digital album be played by only real and acoustic instruments. That’s my fantasy. So we’re talking about it right now, just trying to figure out when.